Aleppo is horrendous. But don't call it a Holocaust. Even before that, a hashtag has been going out #HolocaustAleppo. What is happening in Aleppo is unspeakable. Hundreds of people are being slaughtered mercilessly. The photos and details and horrendous. I don't want to minimize the horror. But for anyone to equate it with the Holocaust is a sickening trivialization of the Holocaust. About 300 people have been killed in Aleppo since last Tuesday. 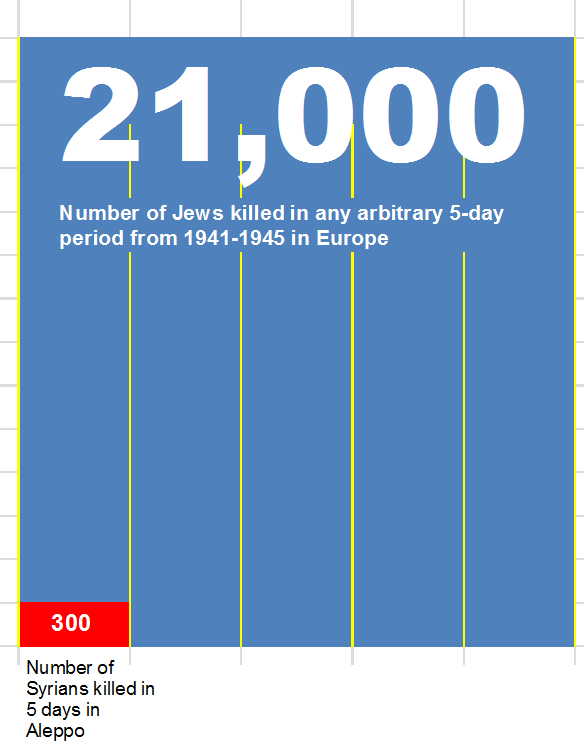 Between 1941 and 1945, on any given day, on the average, over 4000 Jews were slaughtered. Meaning that you can pick any 5-day period during the times of the systematic slaughter of the Jews of Europe and count some 21,000 Jews that would have been systematically murdered on those days. Which is 70 times worse than what is happening in Aleppo on its worst days. No cease fires. No humanitarian pauses. No outside parties bringing in food or water. No White Helmets. And ...no media coverage. That was the Holocaust. It was orders of magnitude worse than anything that has happened in Syria. What is happening in Syria is a gross violation of all morals. But it doesn't come anywhere close to the Holocaust. And any such comparison, while trying to highlight the suffering, is really an unwitting form of Holocaust denial. Is Hezbollah now an army? Dahlan: "Abbas wants to destroy Fatah"
Today is Pretend Lebanese Independence Day! Palestinians even steal Jewish jokes!